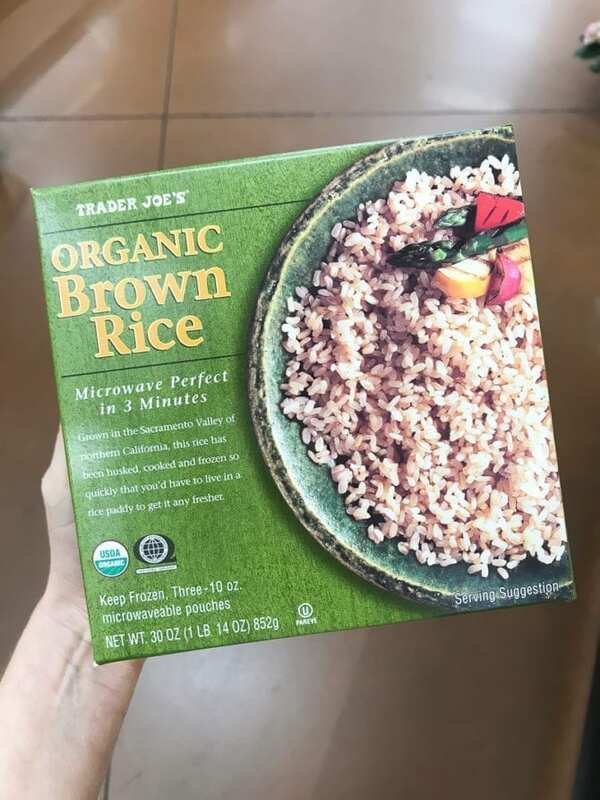 Here’s a list of my top 50 healthy Trader Joe’s must-haves for making delicious and nutritious meals! 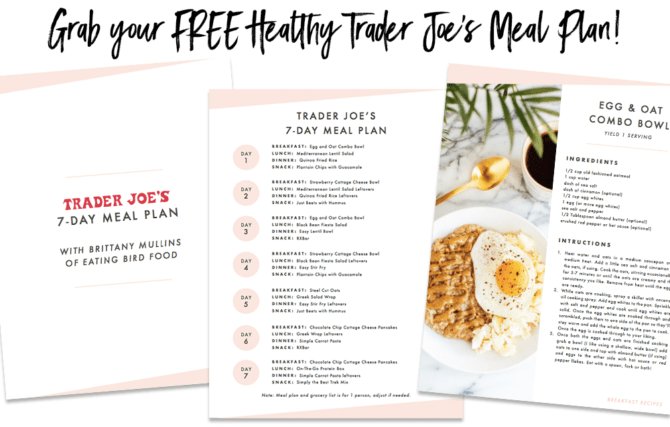 And don’t forget to grab your free 7-Day Trader Joe’s healthy meal plan below! I apologize in advance for anyone who doesn’t have access to a Trader Joe’s. Skip this post or bookmark for when you’ll be traveling near one! Do you fall in the ‘Trader Joe’s obsessed’ camp? Or could you take or leave it? I love Trader Joe’s just because they have so many affordable and healthy items. I don’t do all of my shopping there but I am a regular shopper for sure. There are just so many staples that I can’t find at other grocery stores (or can but they’re double the price)! 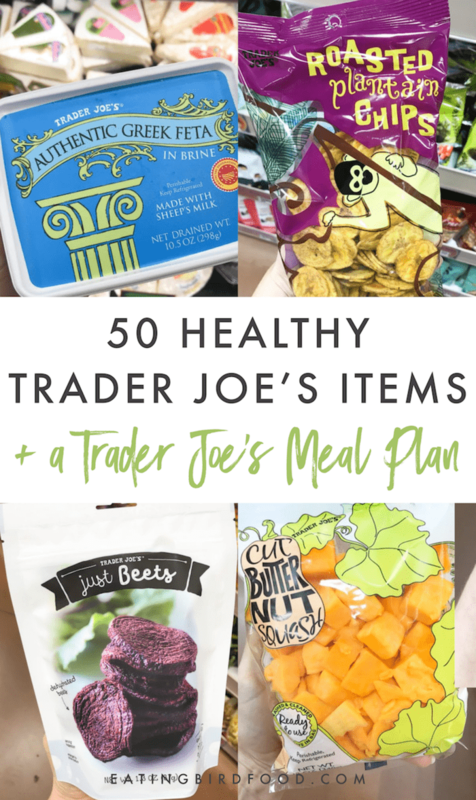 With that I thought it would be fun to share a post with the top 50 must-have healthy items from Trader Joe’s and a healthy 7 day meal plan using TJ’s items. 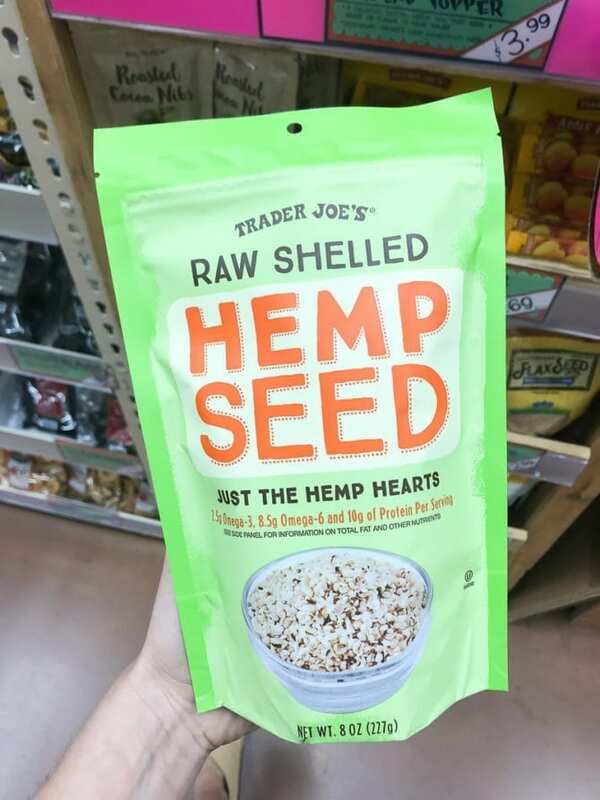 I’ve found that people often assume that everything stores like Trader Joe’s and Whole Foods carry are healthy, but that’s not always the case. 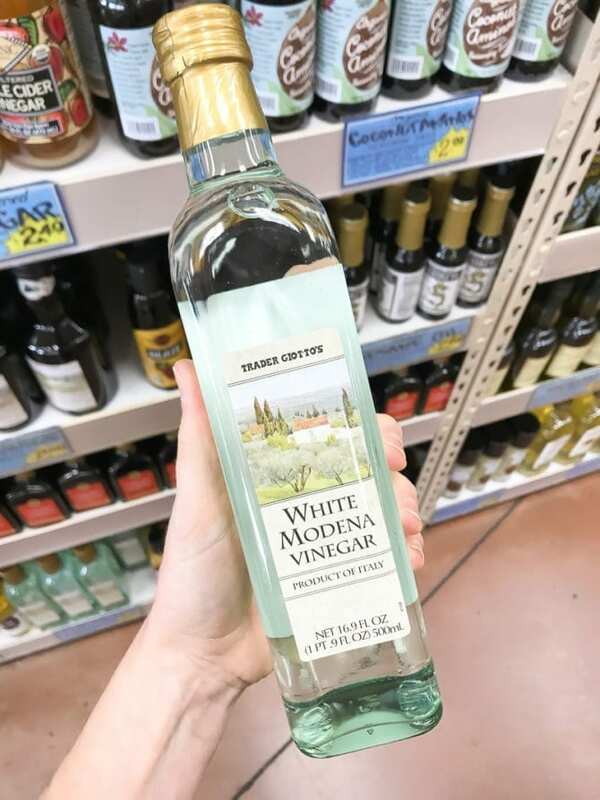 It’s still best to stick to the perimeter of the store (as I typed this I realized that Trader Joe’s keeps their alcohol along the perimeter… #balance) AND you still have to read your labels when it comes to packaged items. I’m a creature of habit and often buy the same things over and over again. Unless I carve out time to scope out all of the new Trader Joe’s items, I’m usually sticking to my usual purchases! 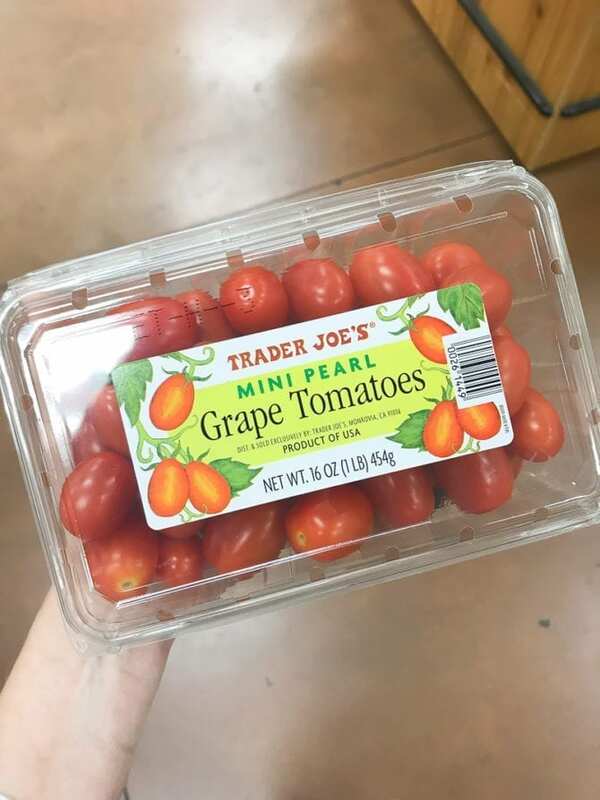 I hope this list gives you some ideas of new healthy staples to buy from Trader Joe’s. 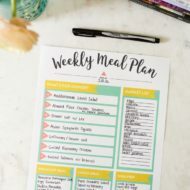 And don’t forget to grab a copy of the healthy 7 day meal plan I’ve put together for you using items from Trader Joe’s! If you love avocados, pick them up at Trader Joe’s! 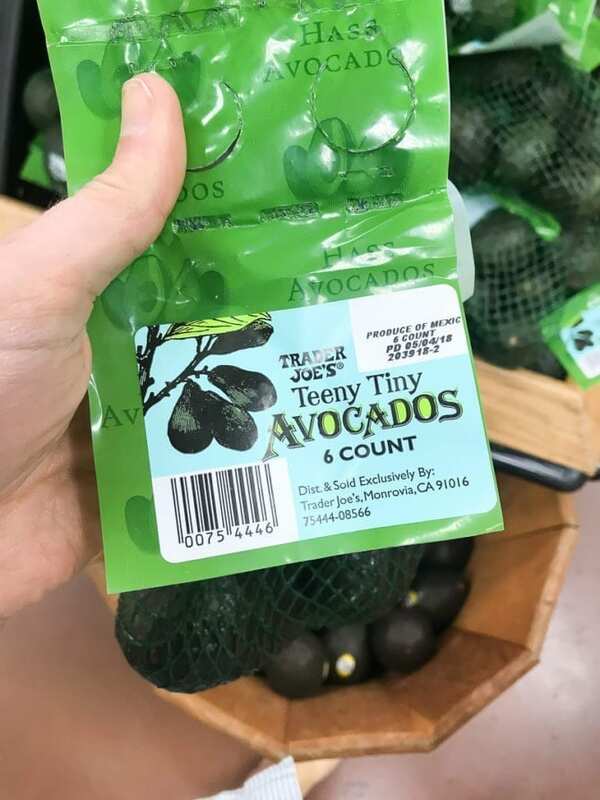 We go through avocados quickly so I love picking up a bag and these teeny tiny avocados are my new obsession. They’re the perfect size for one portion (no leftover avo getting brown in the fridge) and so darn cute. Plus, you can’t beat the price! A great salad topper or quick, poppable snack to have on hand! I used them in my Mediterranean Salmon Salad — so good! 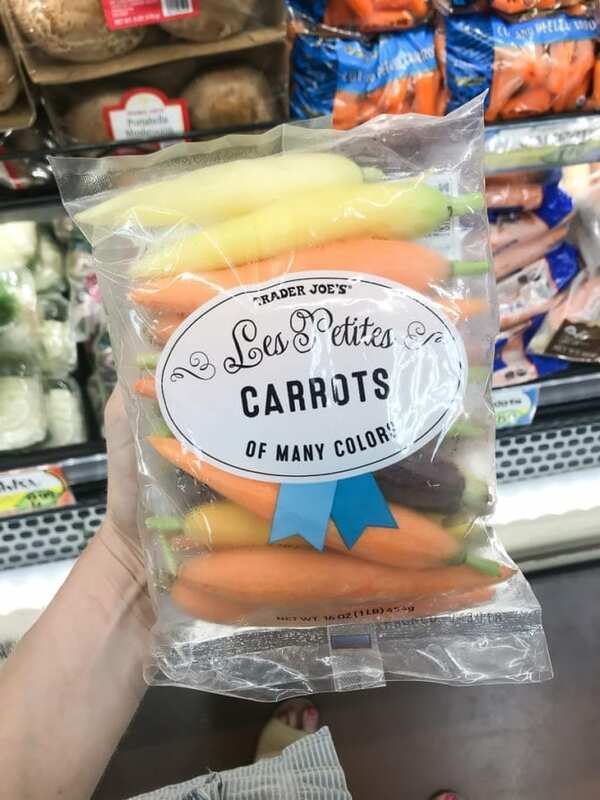 I love colorful carrots. They feel so fancy and they’re great to have on hand for an easy snack. They’re amazing roasted and a great source of crunch when you chop them up for salads. The pre-prepped veggies from Trader Joe’s are the best for saving time! 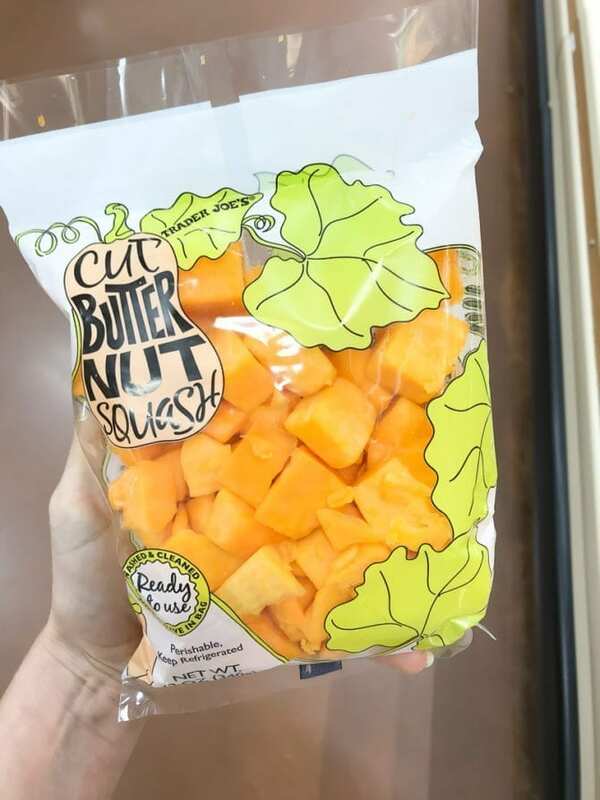 I love this pre-chopped butternut squash because if I’m being honest, chopping squash is… the worst. Use this squash for my Butternut Squash and Turkey Chili or One Pan Roasted Chicken with Butternut Squash and Brussel Sprouts recipes! I feel like this doesn’t need an explanation? 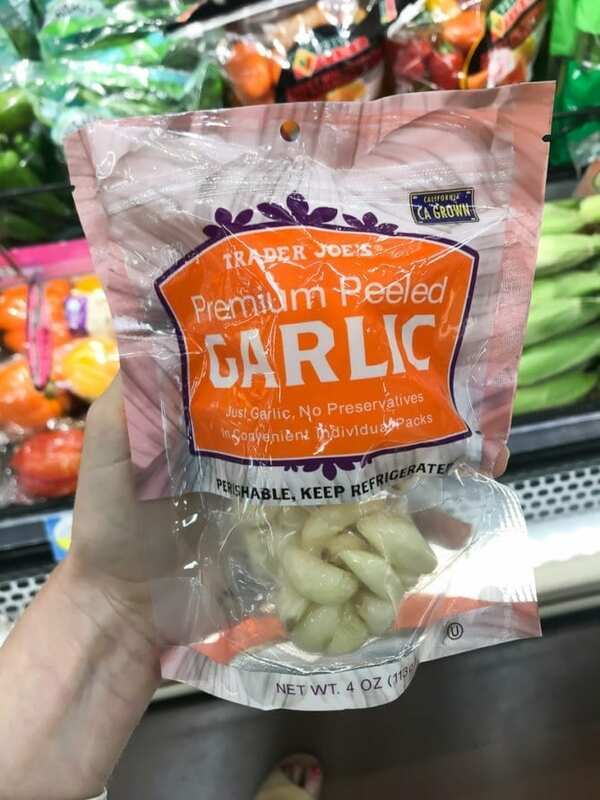 Garlic that is pre-peeled?! YES PLEASE! 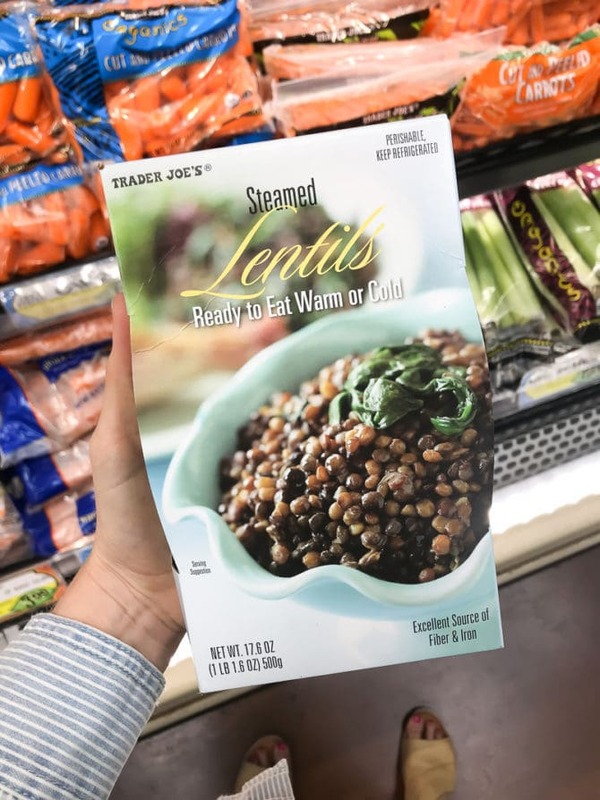 My Trader Joe’s was out of these lentils for a solid month+ and I was so upset! I love having these on hand for a quick and easy protein upgrade for salads and bowls. My favorite way to use them is in this Sautéed Mediterranean Lentil Salad! Another pre-prepped veggie I love to keep on hand! These beets can be eaten hot or cold and are an awesome nutrient boost to salads. 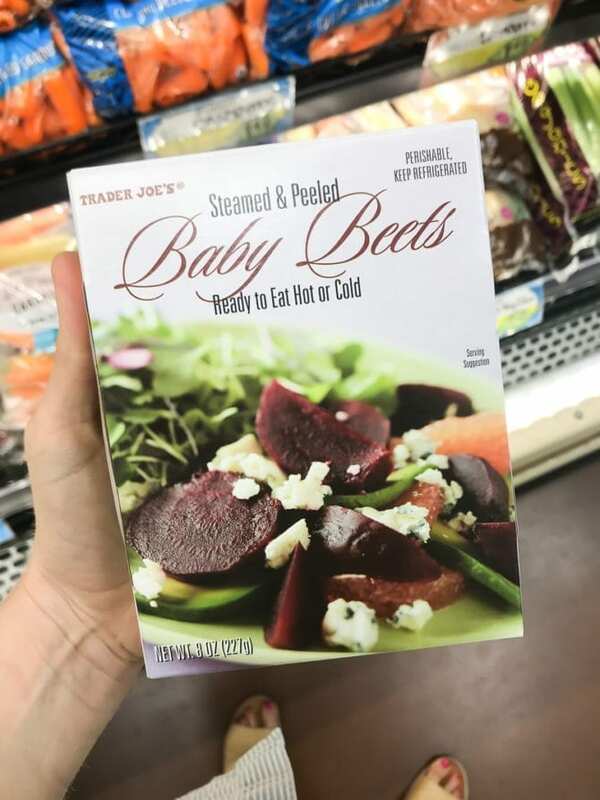 Try them in this Beet Power Salad! One of my most common ‘throw together’ meals is stir fry. 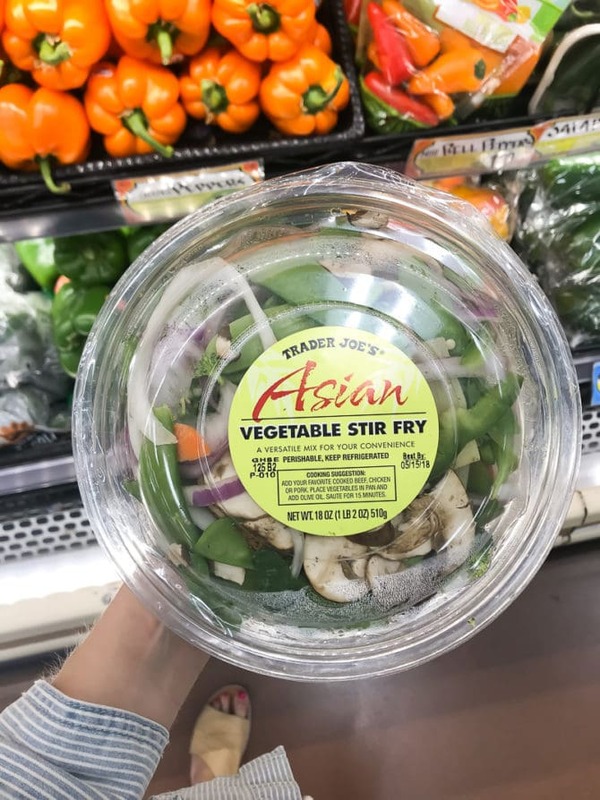 Stir fry gets exponentially easier with this vegetable blend! Prepped and ready to go, just throw it in the pan. Win! Try the veggies with this stir-fry recipe. 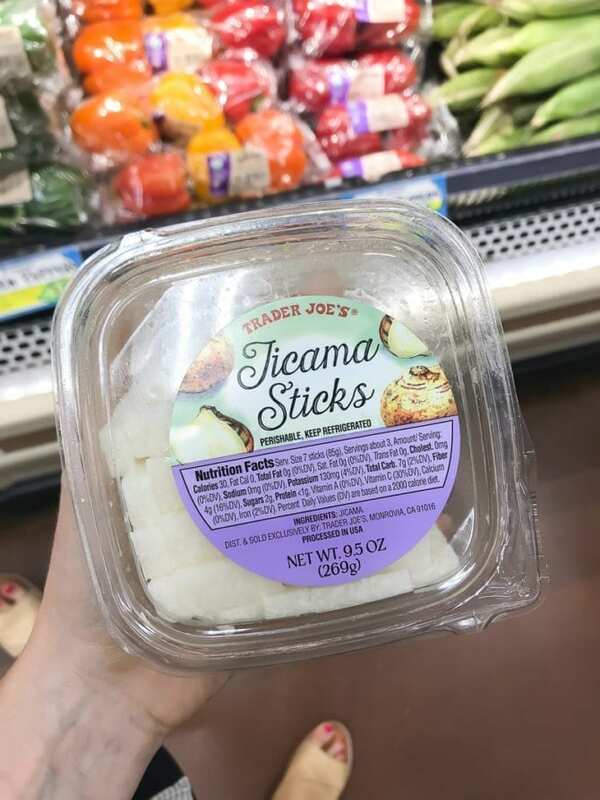 If you haven’t tried jicama, give these a try. They’re so crunchy! I love to eat them as a snack with hummus or guacamole, bake them to make jicama fries or chop them up a little more and add them to a salad for extra crunch! I discovered this mix a couple years ago and love how easy it is to add so many nutrient dense veggies to my meals! I make egg scrambles with this mix or love it in my crunchy detox salad. 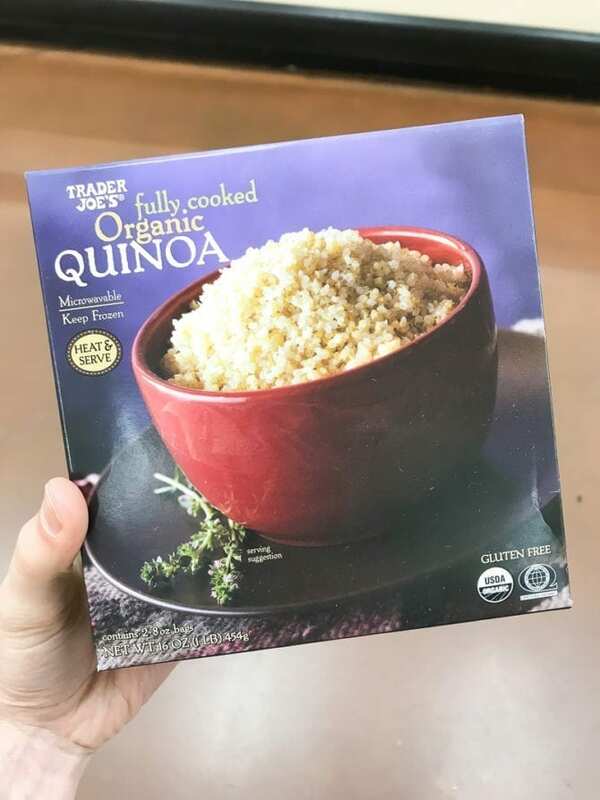 Do you guys remember when Trader Joe’s first came out with cauliflower rice? I feel like it went viral and was rarely in stock! 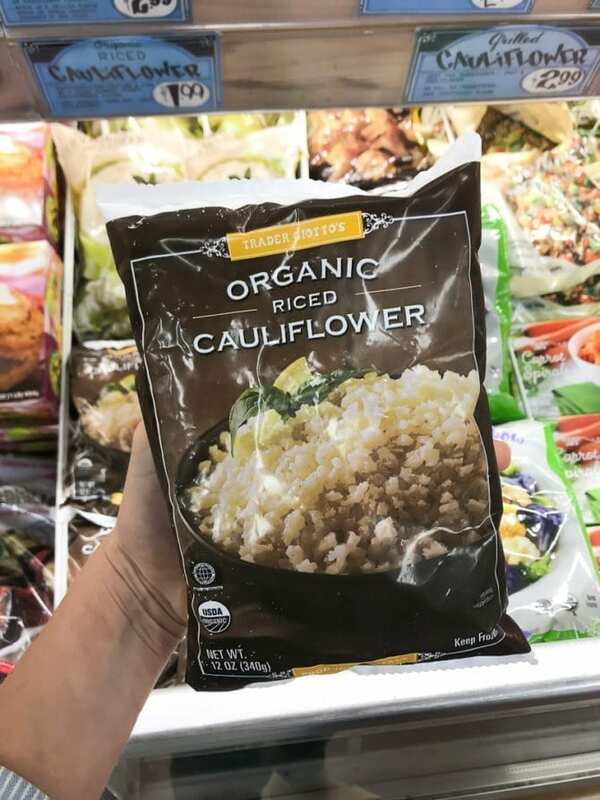 Now you can find it in the fresh or frozen section and it is worth hunting down! Here are 17 ways to use cauliflower rice. One you may not have tried yet — adding frozen cauliflower rice to smoothies. Trust me, it makes smoothies extra thick and creamy. 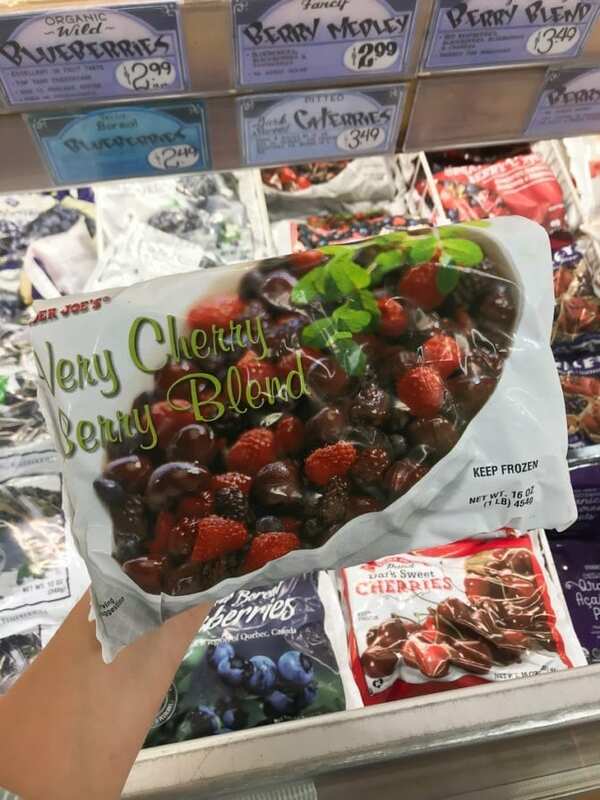 This frozen cherry berry blend is perfect for smoothies! You could incorporate this mix into almost any smoothie but try this recipe for a chocolate cherry smoothie if you’re a recipe follower! Again, amazing for smoothies! 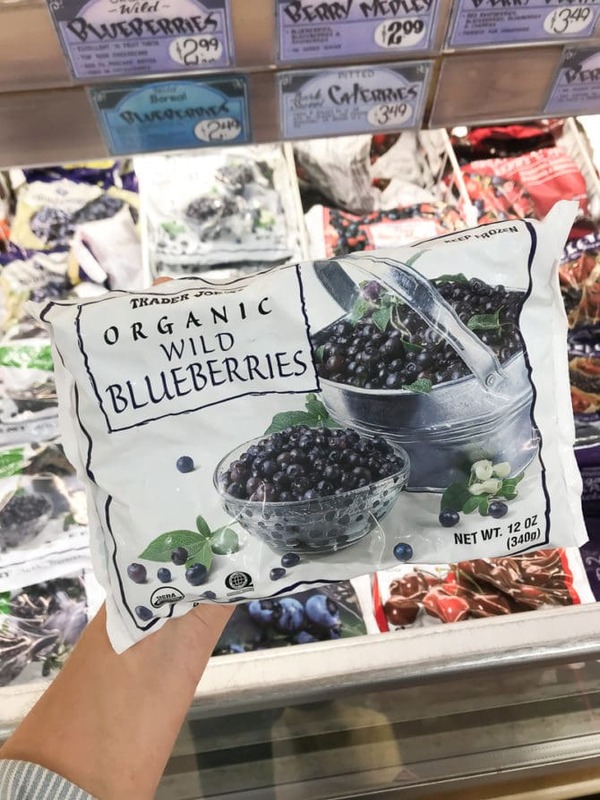 You could also use these frozen blueberries in my blueberry breakfast salad. My life changed when I found out you can roast frozen vegetables. Check out my recipe for roasted frozen broccoli here! 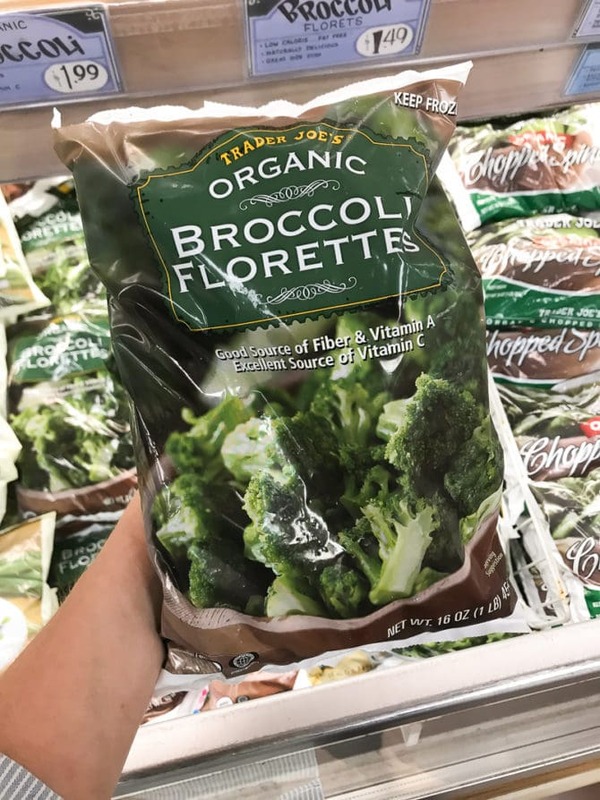 I love having these broccoli florets on hand for a simple side or veggie addition to my salad. I know, I know, making rice and quinoa doesn’t take that much effort or time but sometimes it does! Whole grains that are ready to serve in less than 10 minutes? Right up my alley. 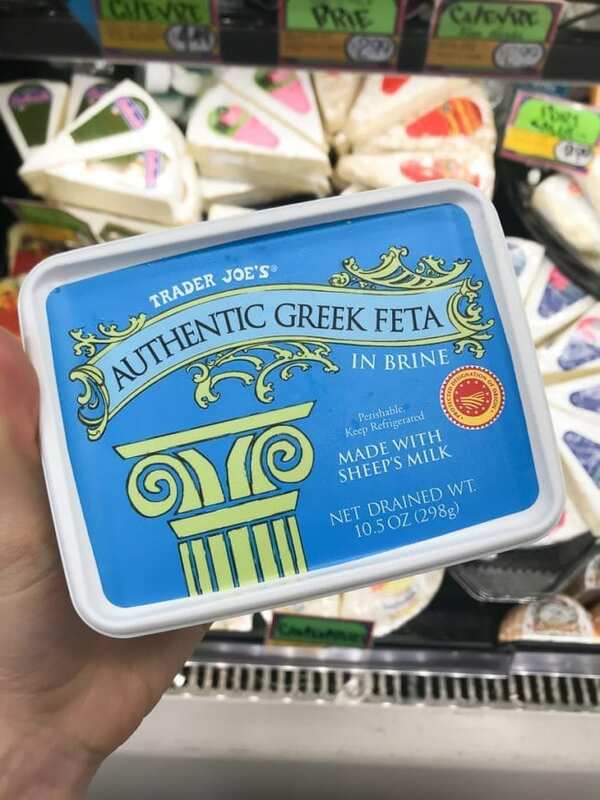 If you’re a feta fan, you need to try this authentic version that’s made with sheep’s milk and packaged in brine! I love this Kale and Feta Crustless Quiche or these Spinach and Feta Turkey Burgers. 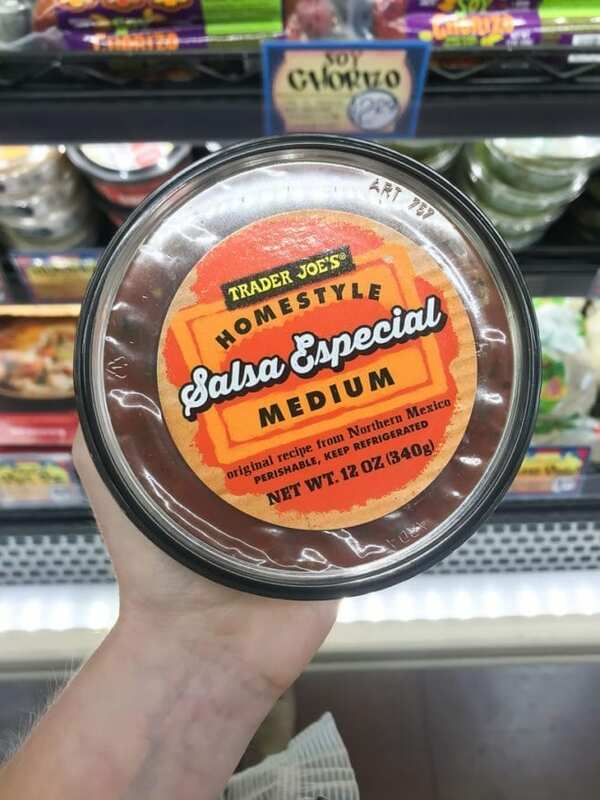 Found in the pre-prepped food section, this salsa is my new go-to! Top my tempeh taco meal prep bowls or my turkey taco salad with this salsa for a flavorful meal! Another product I feel needs no introduction. 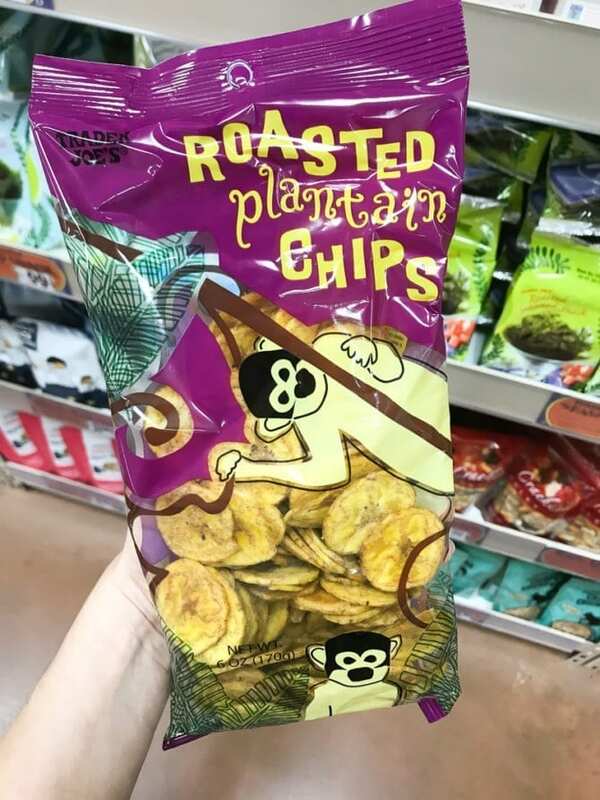 If you haven’t tried plantain trips, do yourself a favor and give these a try! I love them on their own or dipped in basically any dip… especially guac. 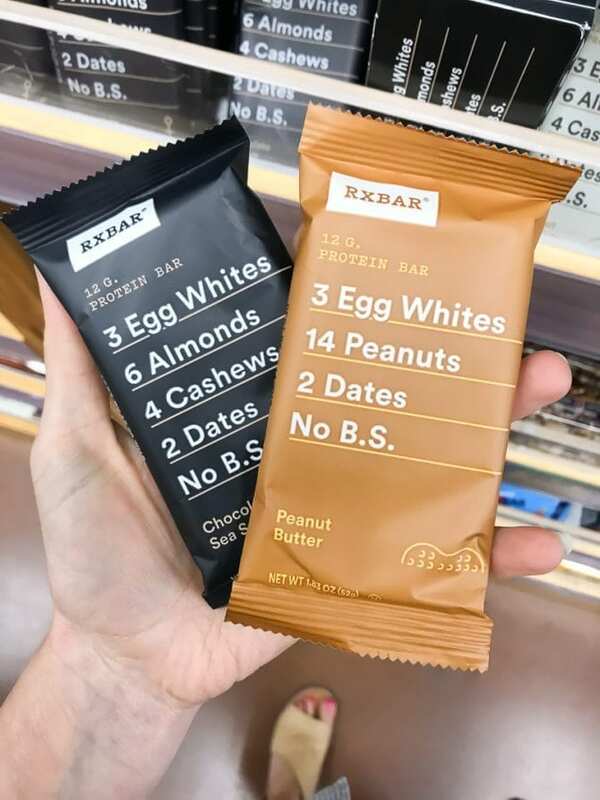 I was so happy when Trader Joe’s started carrying RxBars. They have great ingredients and are high in protein for a snack bar! I usually keep one in my purse for a post-workout snack. 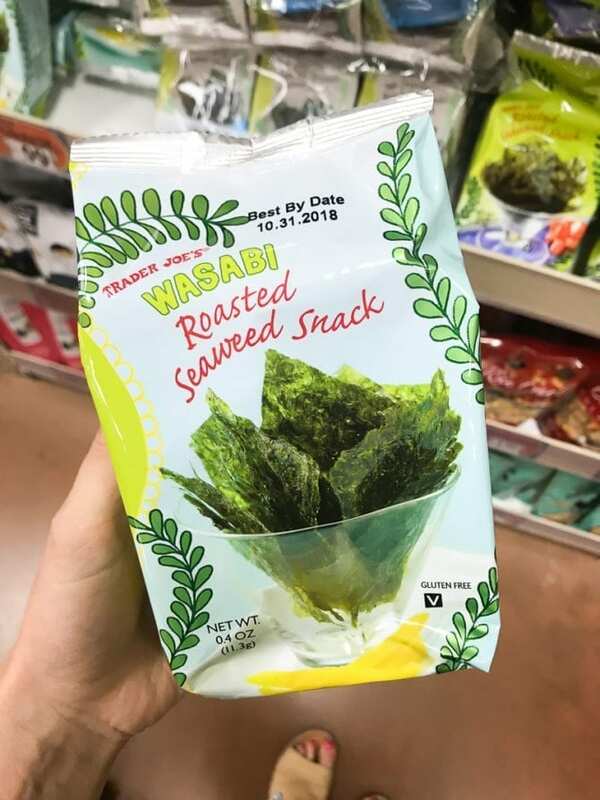 I know snacking on seaweed sounds kind of strange but these seaweed sheets are actually so good and they totally work for satisfying a craving for salt. I love the wasabi flavor, but watch out because it does have a kick! 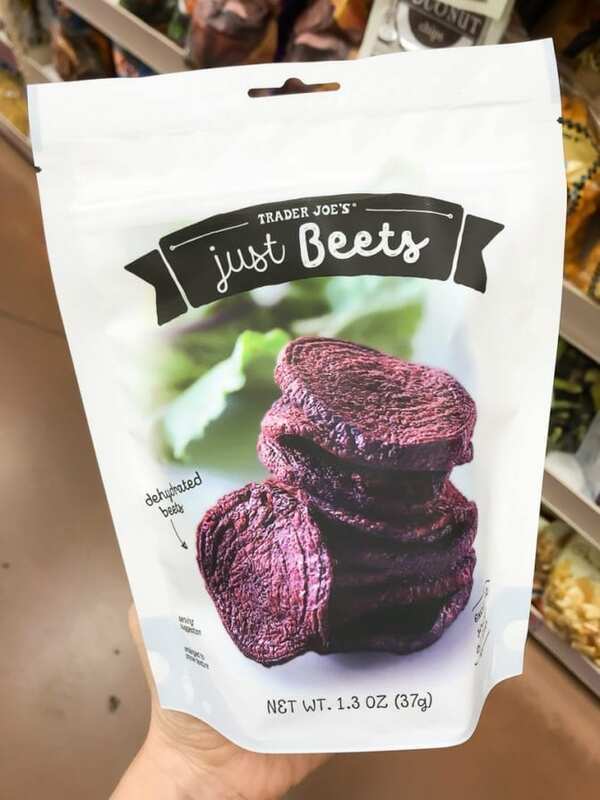 Such a fun take on a chip, these beet chips are literally ‘just beets’ and they’re so crunchy! I love them on their own or dipped in essentially any sauce. One of Isaac and my’s guilty pleasures, but I don’t buy them too often because they’re addictive. 😉 These are so salty, crunchy and delicious! If you’re looking for a road trip or vacation snack, these are your guys! 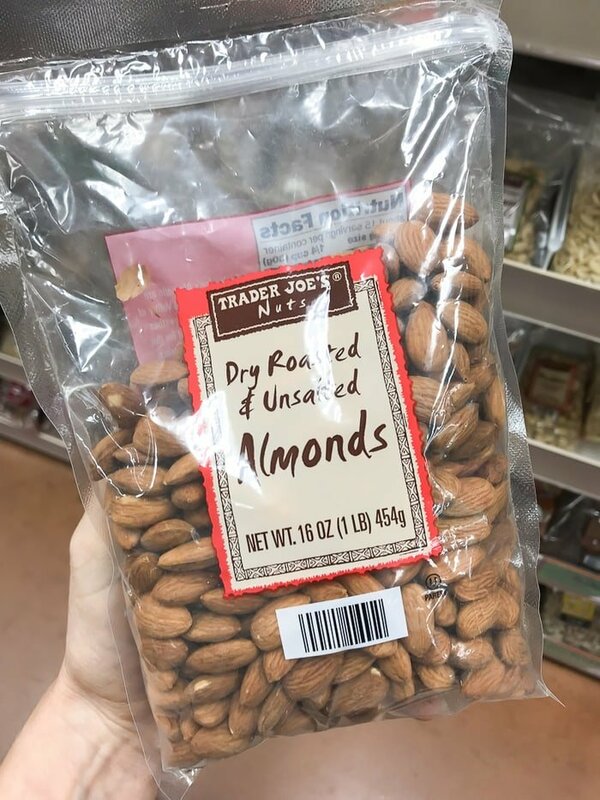 Trader Joe’s has such a great selection of nuts and at great prices – raw, roasted, salted, unsalted. 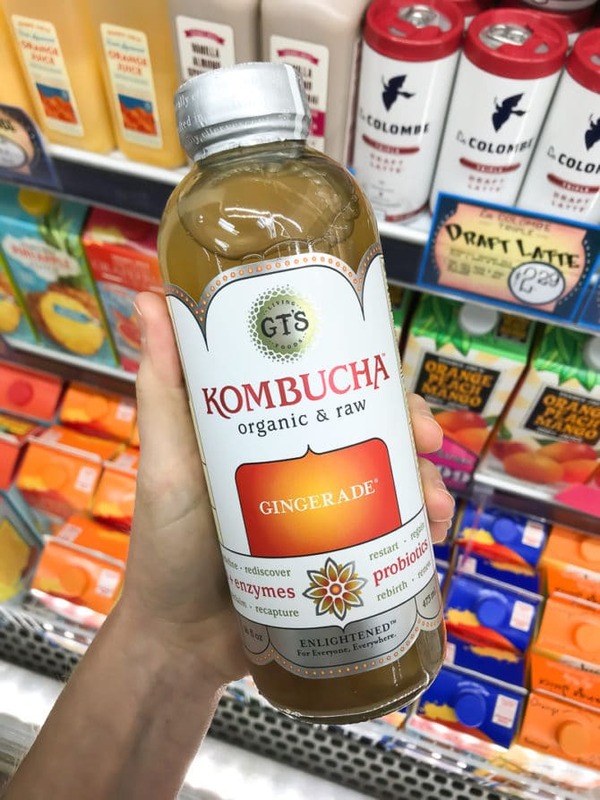 Yes, they carry kombucha! I love GT’s but they have a variety of brands (even a few that are local) so find what you prefer. This seasoning has a cult following and for good reason. I love this on basically everything… salads, avocado toast, eggs, popcorn, meat, pizza. Again, anything. Another spice blend that has a following! 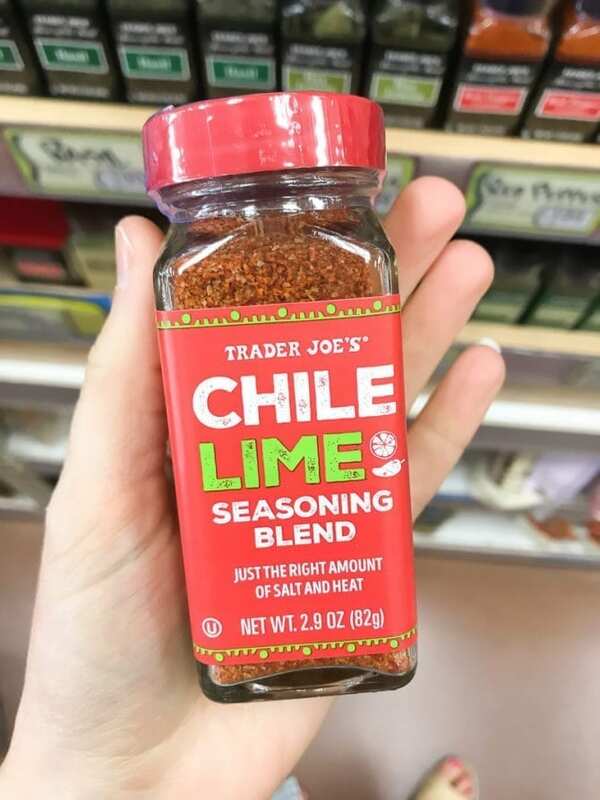 Try this on fish, chicken, veggies, salad, tacos, jicama… so many options! I always have a good vinegar on hand for dressings or marinades. 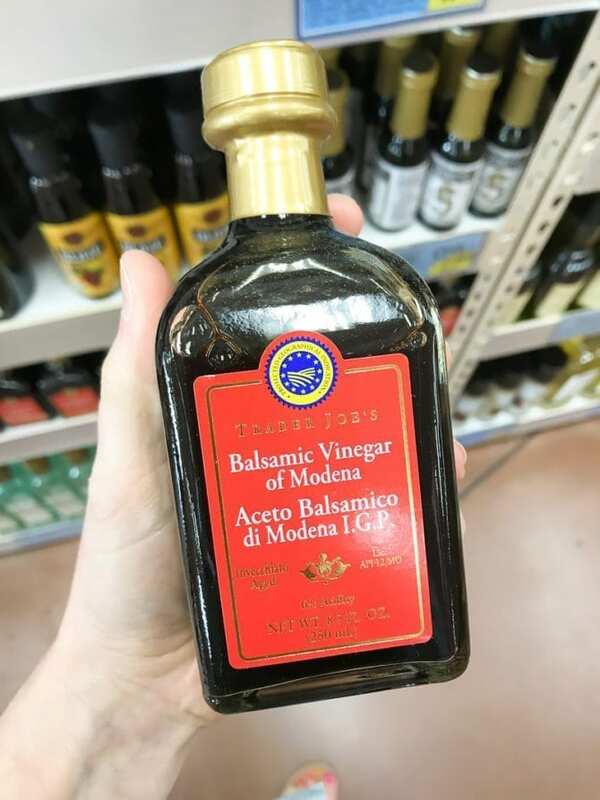 If you’re unfamiliar, definitely give the white Modena balsamic a try — it’s a tiny bit little sweeter than regular balsamic and I love to use it on salads that I’m bringing to parties because it doesn’t turn the whole salad brown like regular balsamic does. 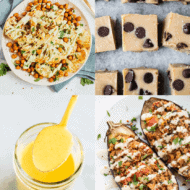 Try my avocado balsamic dressing or my maple balsamic tempeh bowls with pumpkin rice. 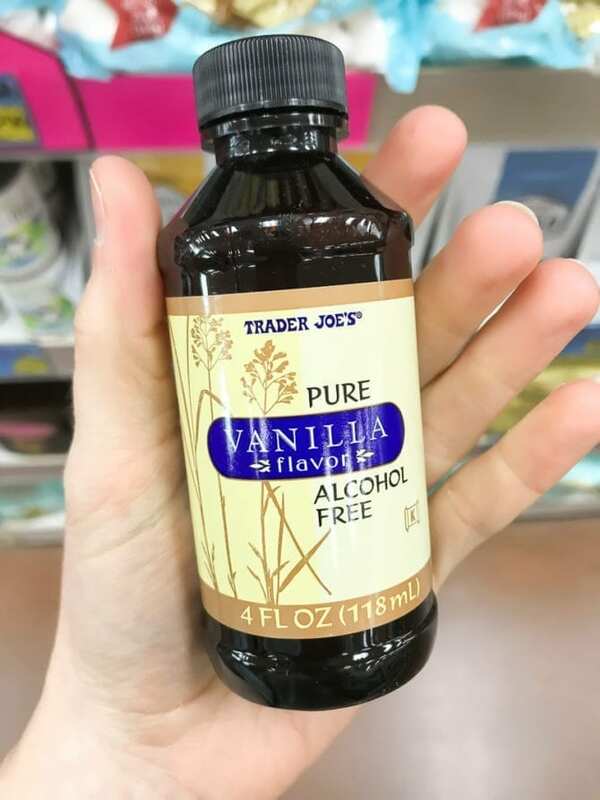 You can’t have enough vanilla extract, can you? 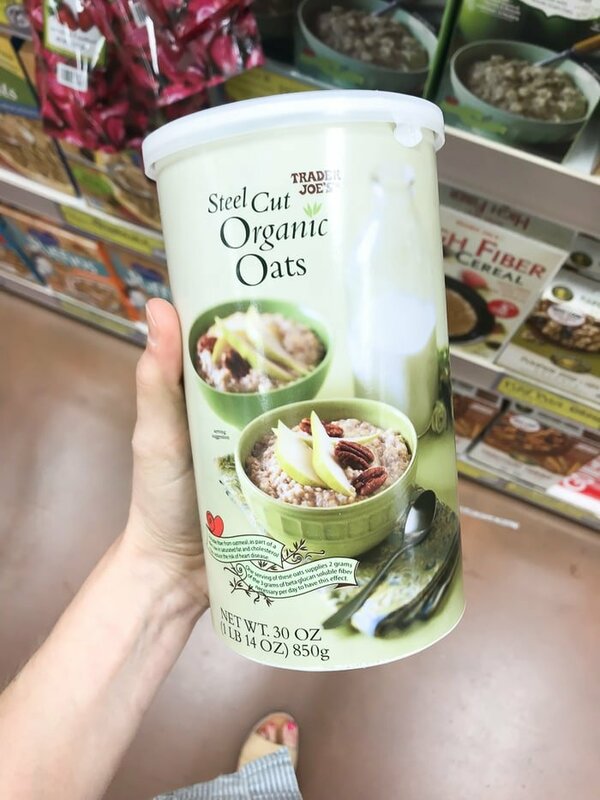 I always keep this on hand for smoothies, oats, and any baking I do! Another spice mix I love to have on hand. Pretty self explanatory — season meat, beans and even veggies for amazing tacos or taco salad bowls! 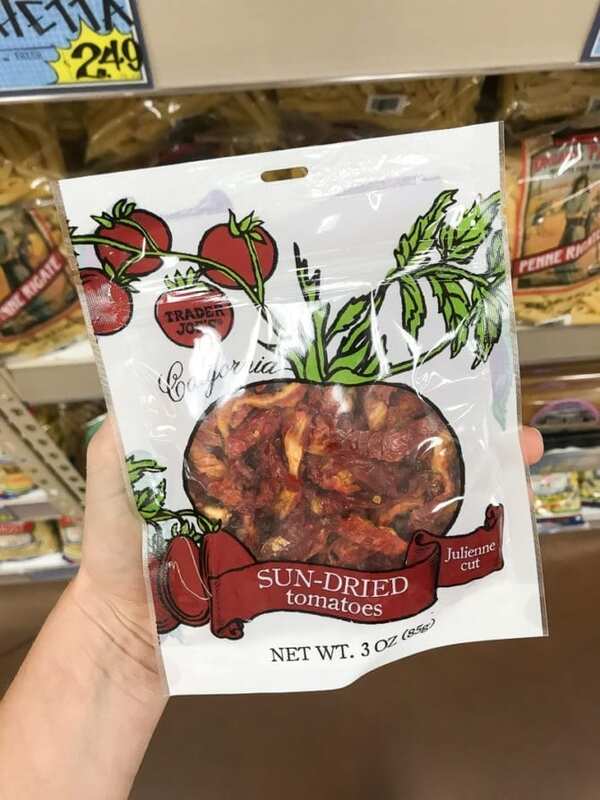 More pantry staples that Trader Joe’s sells for an amazing price. I always stock up! This coconut oil and coconut oil spray is so budget friendly! I love keeping both on hand for a good high-heat cooking oil. 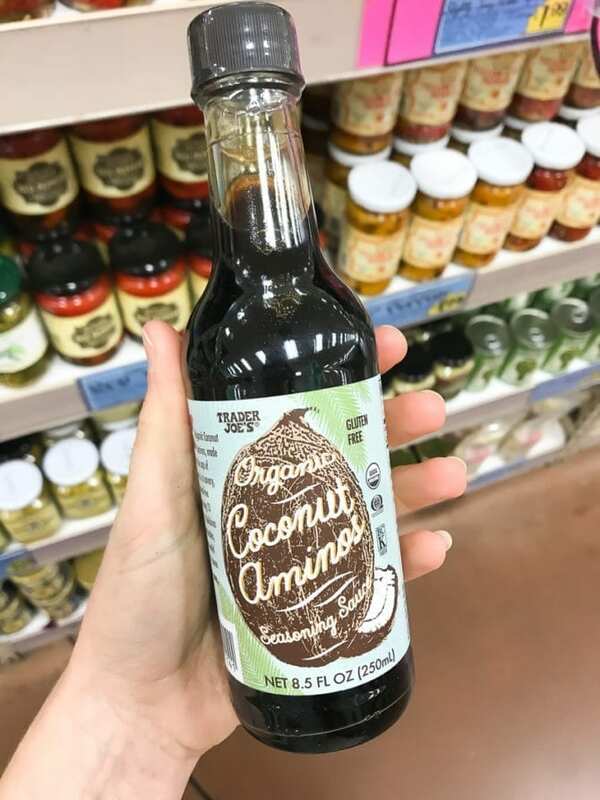 Have you ever tried coconut aminos? They’re a great gluten-free and paleo alternative for soy sauce and they’re a little sweet from the coconut! I love using the aminos as a sub for teriyaki sauce. Try either of these recipes out: Tempeh with Kale + Coconut Aminos or Pineapple Fried Quinoa. 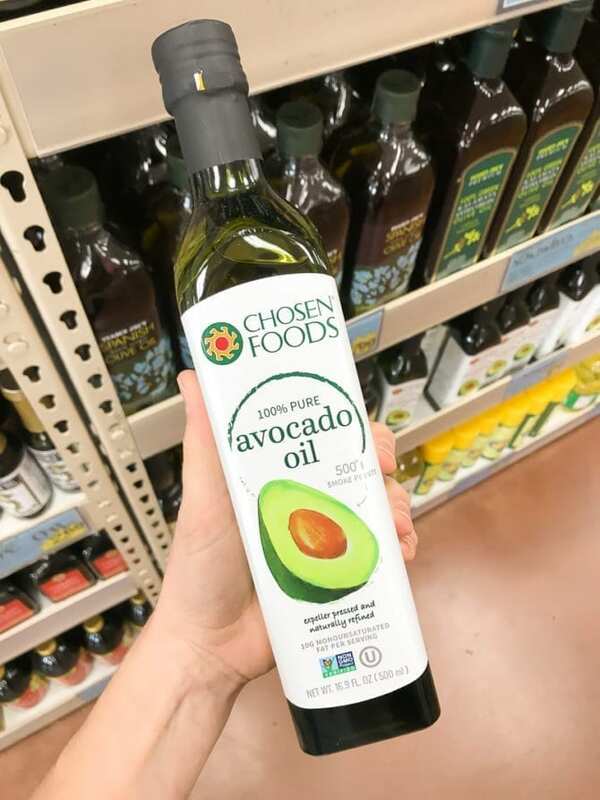 The price of this avocado oil is why I always keep it in my pantry! Avocado oil can be expensive so give this one a try! Avocado oil is nutrient-dense (filled with healthy fats) and a great high-heat oil — meaning it’s great for cooking at high temps! 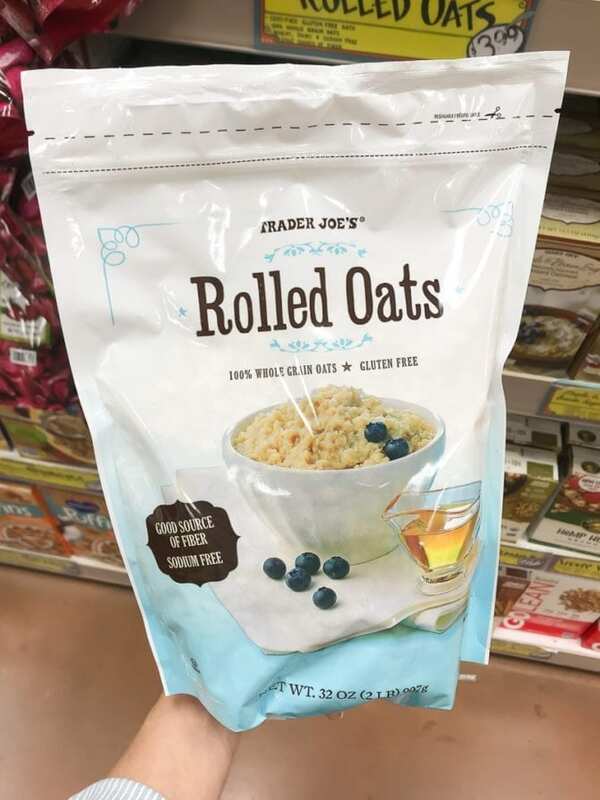 I love stocking up on oats at Trader Joe’s! I use the gluten-free rolled oats for overnight oats. I love the steel cut oats in this creamy steel cut oats or this apple cinnamon baked steel cut oatmeal recipe. Two more pantry staples. I have been a fan of hemp for awhile. If you’ve never tried, it here are some great recipes: blueberry hemp crumble bars, hemp tabbouleh and grain-free overnight “oats”. 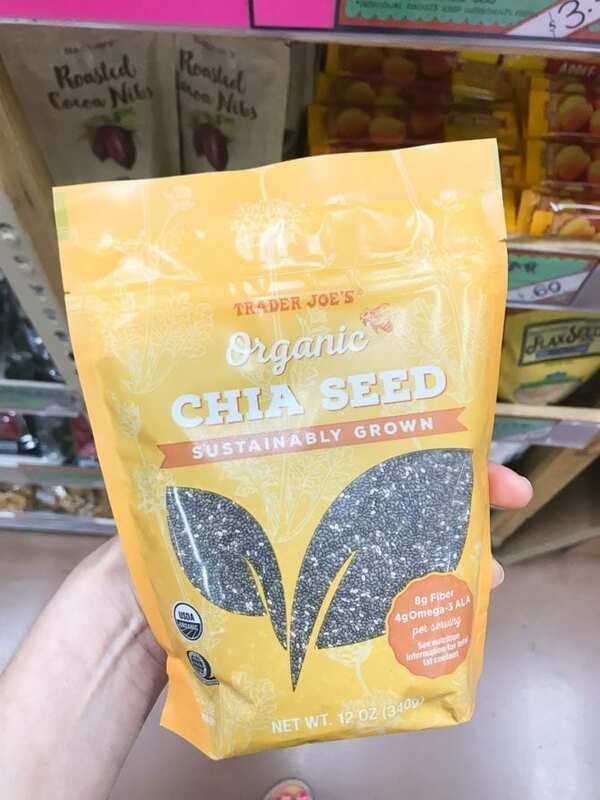 Chia seeds are amazing for so many reasons — I even wrote a post titled ’10 Ways to Eat Chia Seeds’! Unsweetened coconut is something else I love to keep on hand. 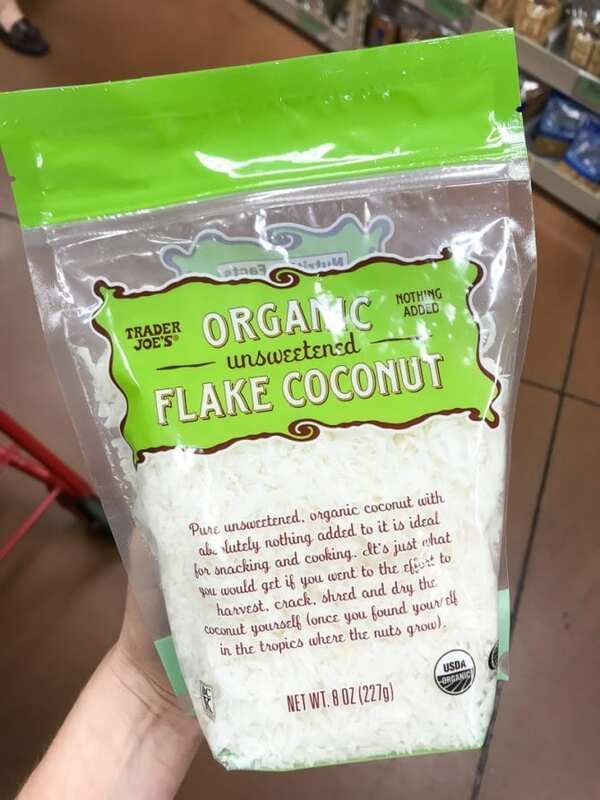 It’s great for making coconut butter, energy balls, snack bars, granola, and smoothies! Are you an almond butter or peanut butter lover? I can’t live without either. 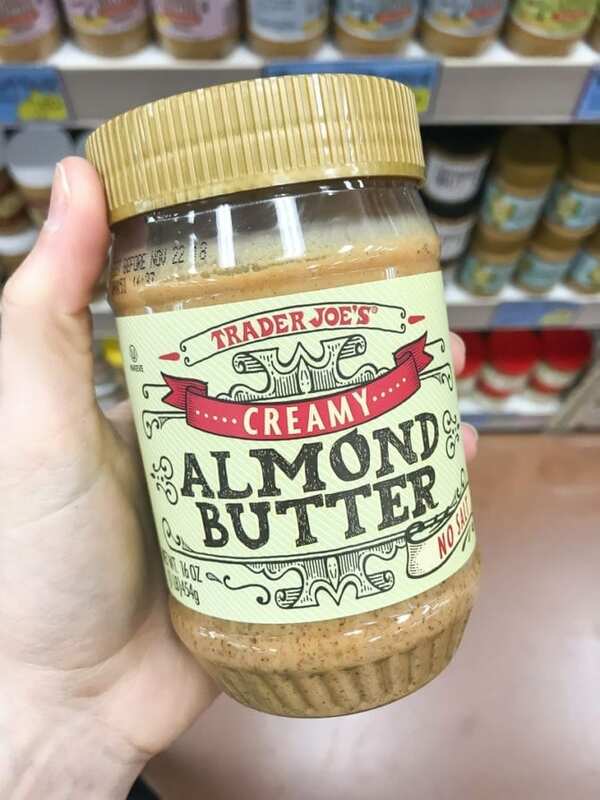 Trader Joe’s has some great nut butters that are super affordable! I always keep nut butter on hand for oats, stuffed french toast, fluff bowls, smoothies, energy balls, dressings and let’s be honest… eating by the spoonful! 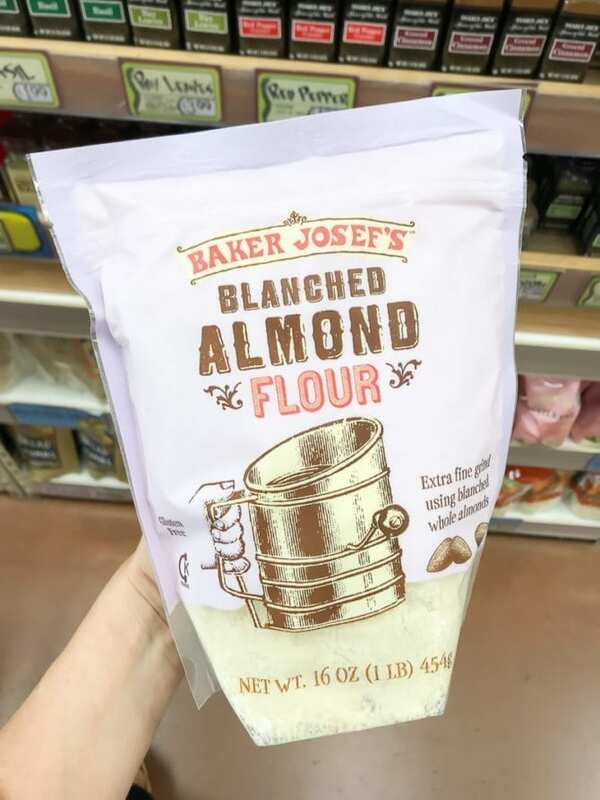 I really like baking with almond flour for gluten-free, paleo treats! Try these carrot raisin almond flour muffins, these 3-ingredient crackers and these almond flour crescent cookies. Another pantry staple. Cacao powder is less processed and more nutrient dense than regular cocoa powder. 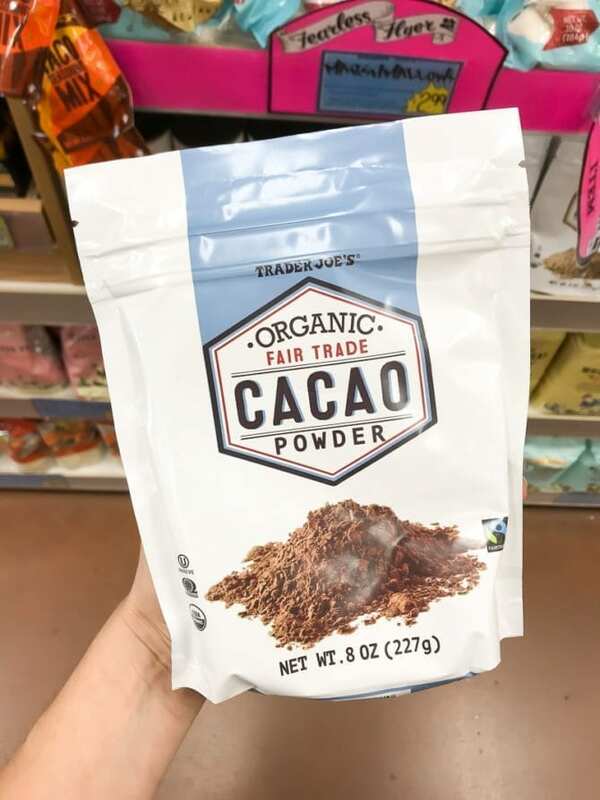 These tasty treats both use cacao powder: German chocolate energy bites with pecans or raspberry cacao chia seed pudding. Give them a try! 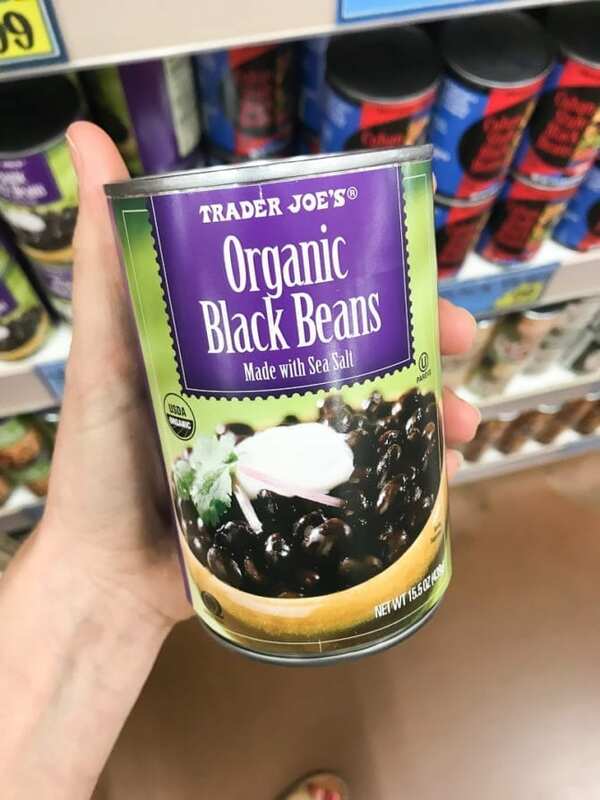 I always have canned beans on hand for an added protein and fiber source in bowls and salads! Two of my favorites = black bean fiesta mason jar salad and this curried chickpea salad. Oh man, I use egg whites all the time and I love that I don’t have to worry about wasting the yolks. Try this protein pumpkin oatmeal with egg whites or sweet + savory egg and oatmeal combo bowl. I love finding upgraded products and this is one of them! 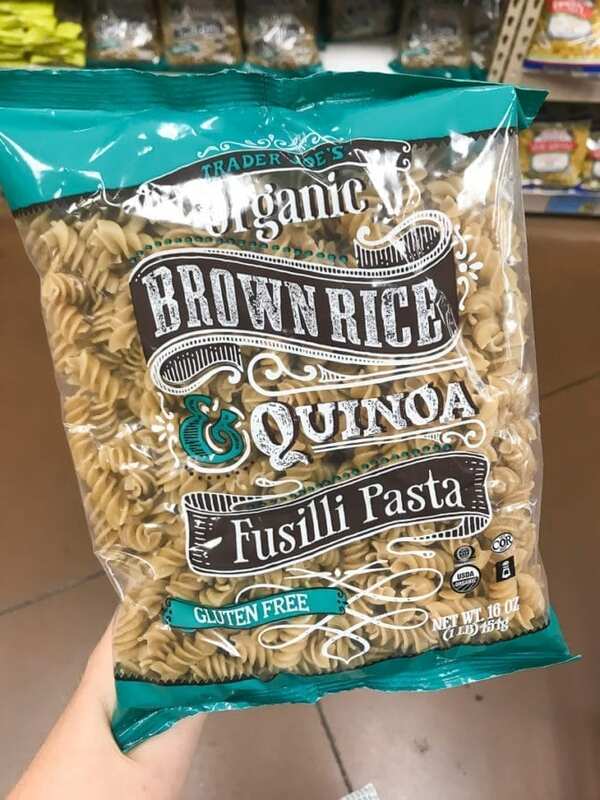 Rather than using white flour noodles, I love using these brown rice & quinoa pasta noodles because they’re whole-grain, gluten-free and taste awesome! No one knows the difference. 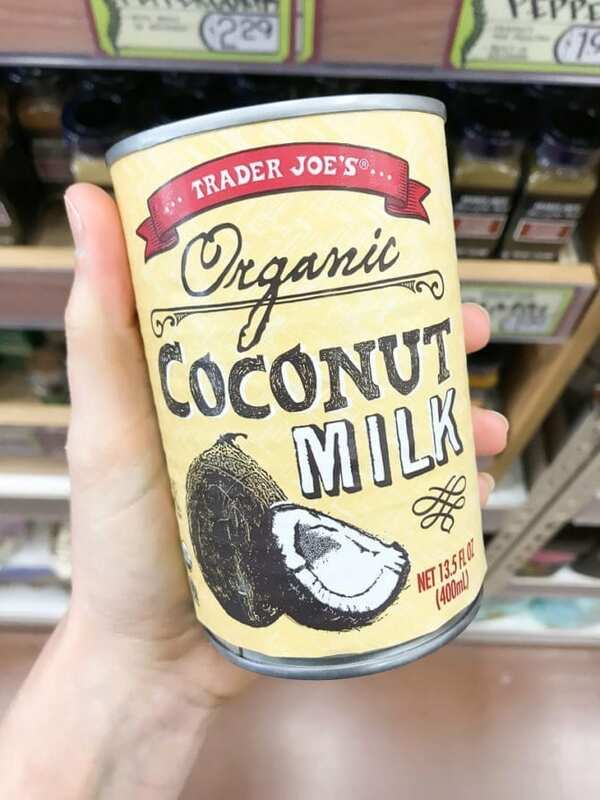 Coconut milk! 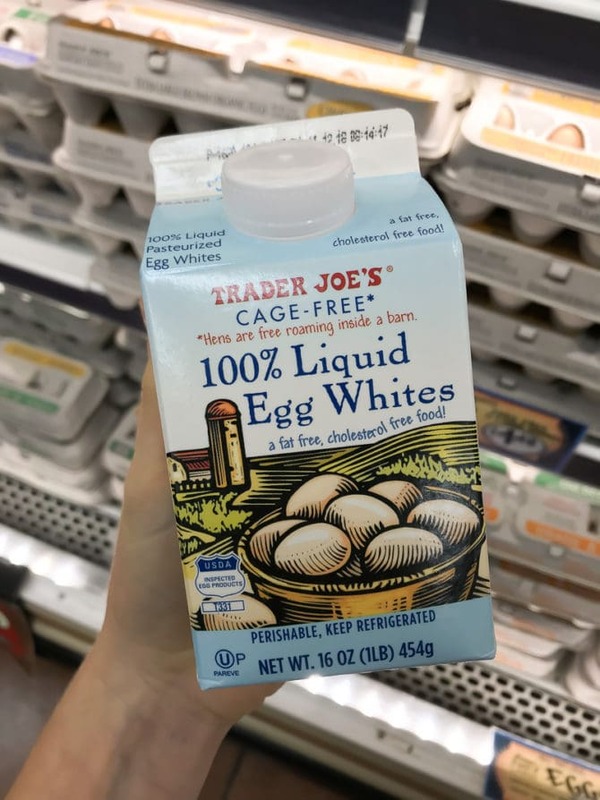 Trader Joe’s has regular, lite, and coconut cream. I love keeping coconut milk on hand for curries, chia pudding, dairy-free butter chicken, smoothies, oat bowls…so many things! 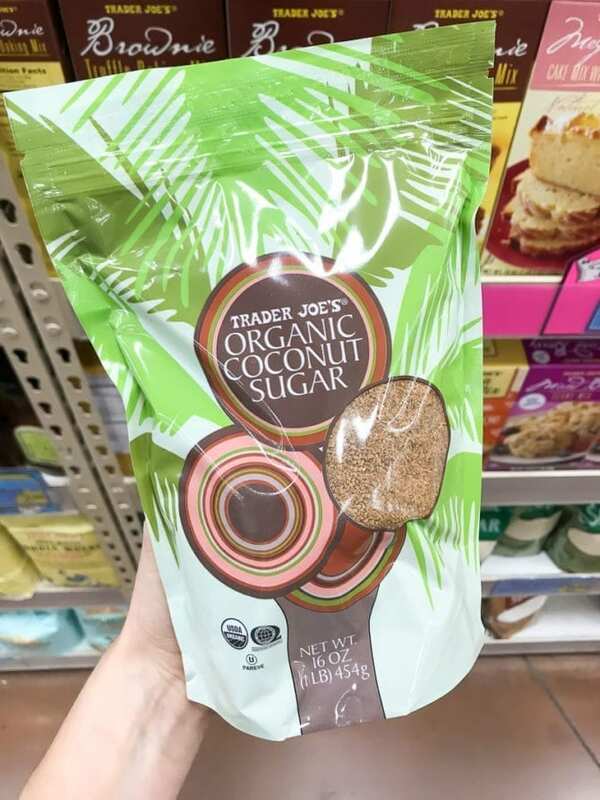 Coconut sugar is less processed and has more nutrients than just straight white sugar. 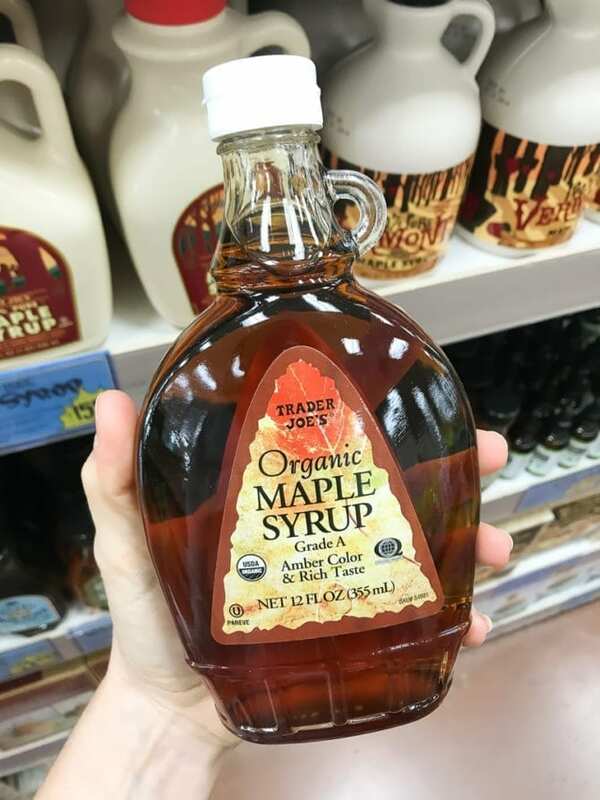 I like to use it in baked goods in place of plain white sugar! Try it in this banana bread recipe. 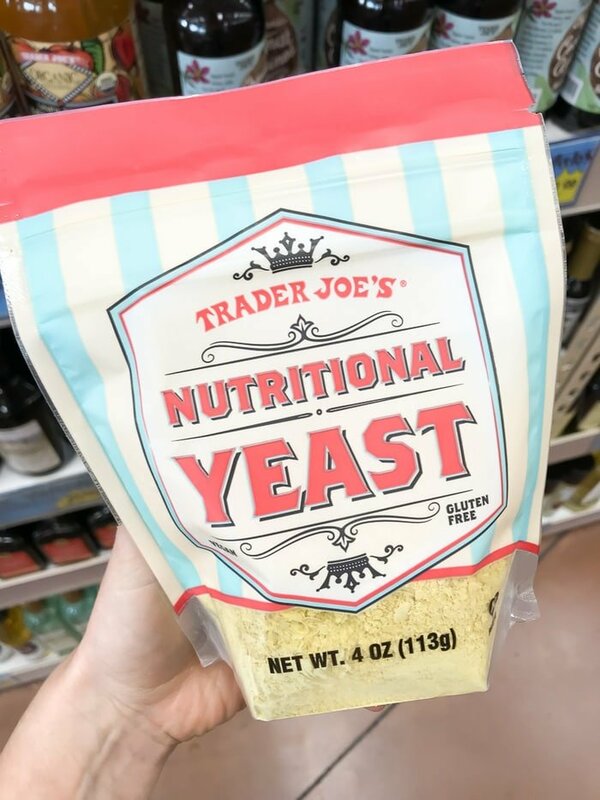 Nutritional yeast brings a great nutty, cheesy flavor without the cheese! You can sprinkle this on pretty much any any entree. I recently used it in the best Tempeh Veggie Burgers and my Golden Turmeric Tahini Dressing. 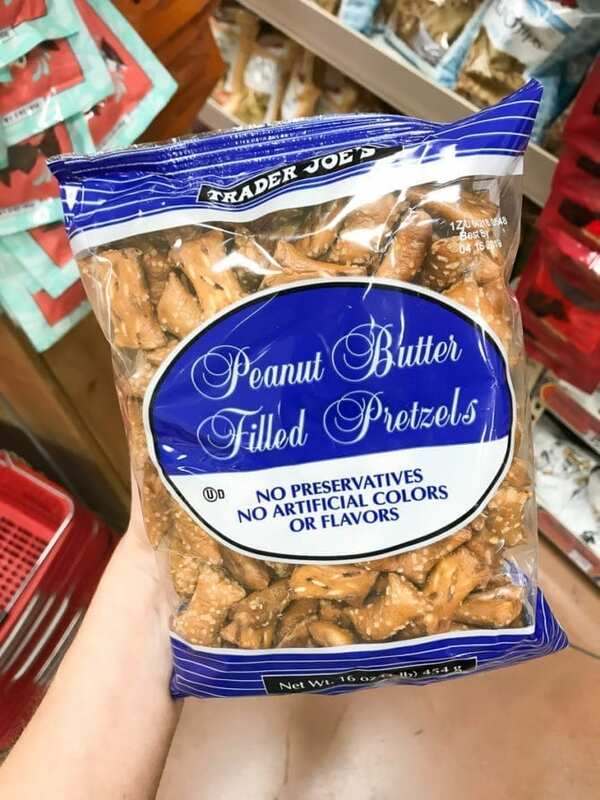 These aren’t necessarily a pantry staple but when I need them, I always grab them at Trader Joe’s because of the unbeatable price! I topped my Mediterranean Farro Salad with sun-dried tomatoes. 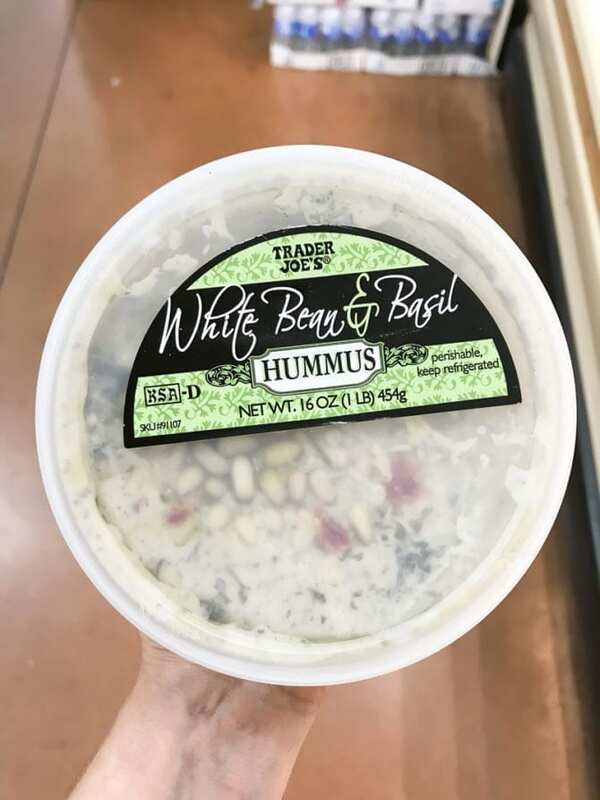 Make sure you check out the hummus section the next time you go to Trader Joe’s. They have a huge selection. The garlic is great but I really like the white bean & basil hummus as well — so much so I created my own copy cat recipe. I love having hummus on hand for a simple snack or to use a dressing on salads. It also makes a bomb tuna salad! Did I miss anything? 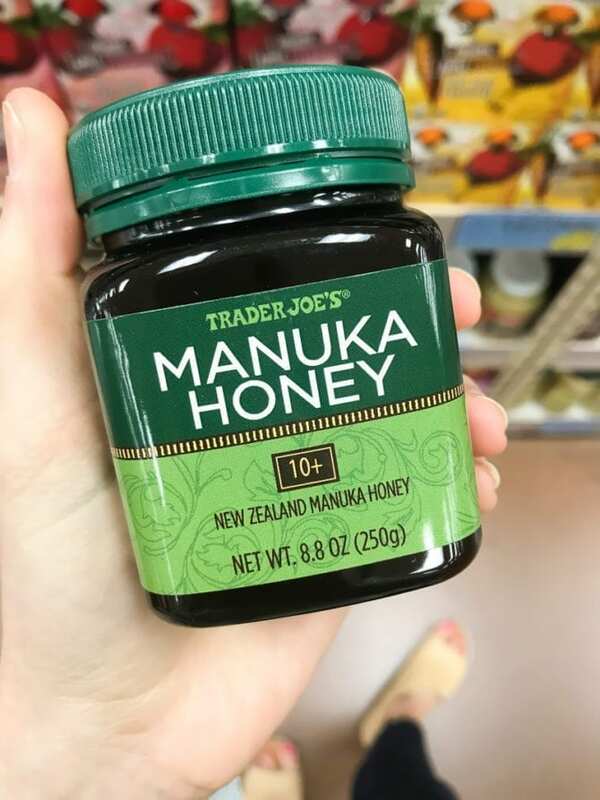 What are your favorite healthy Trader Joe’s items?! Please let me know what I need to try in the comments! Ahhhh this all looks SO yummy! I wish I had a Trader Joes near me :(! I’ve been dying to try that “everything but the bagel” seasoning. 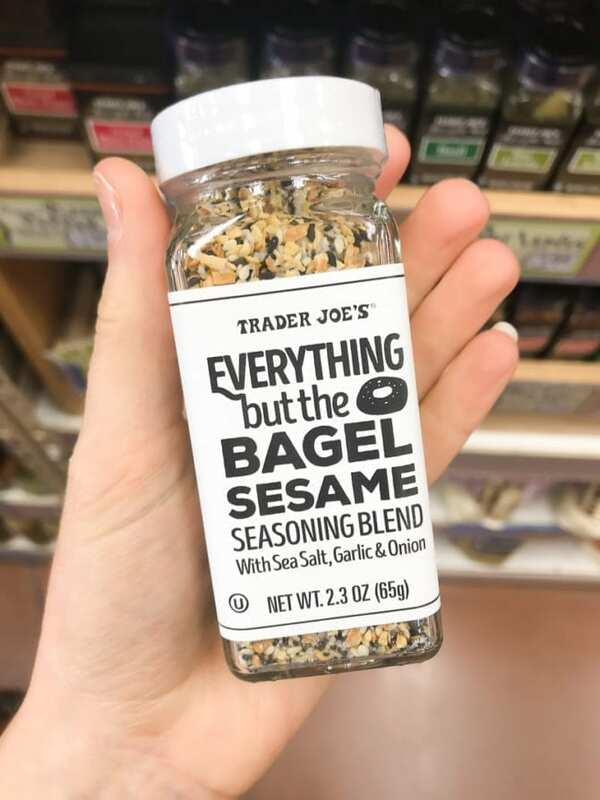 You can order the TJ’s “everything but the bagel” seasoning from Amazon. Oh! Thank you for sharing, Brittany!! Hi Brit. For some reason, I can’t figure out how to grab the TJ’s meal plan. When I pinned and opened it, I just got the same blog post from today. Any hints? Hi Deborah! To get the meal plan just fill out your name and email address in the little form on this post. Then the meal plan will be emailed to you. Let me know if you’re still having trouble. Awesome list! Thank you for putting it together. 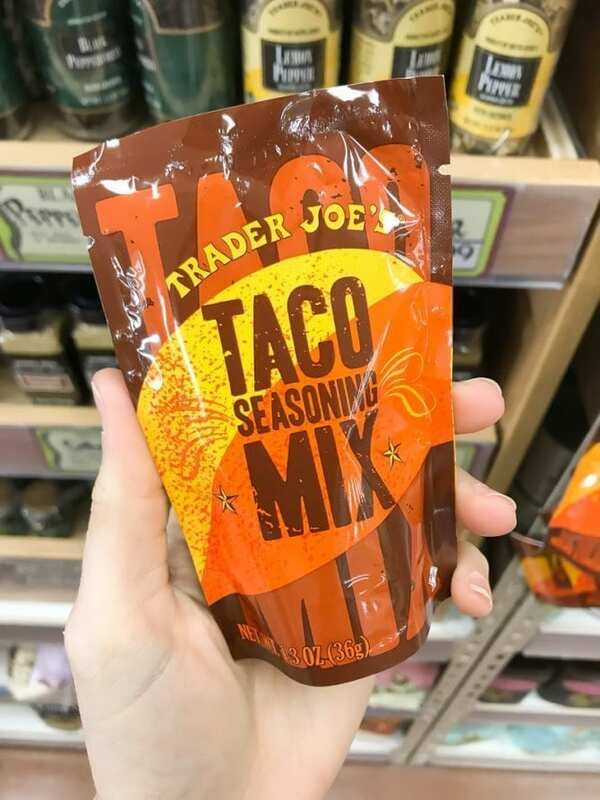 I definitely need to visit Trader Joe’s for an overdue visit. Thank you for this list! So often articles about TJs focus on the pre-made meal options and guilty treats while overlooking all the great healthy staples! 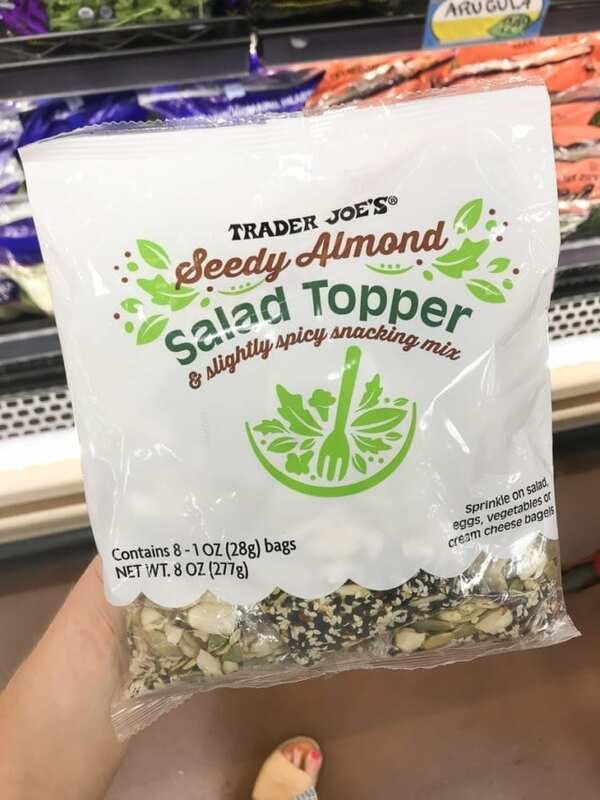 I am definitely looking for that seedy salad topper the next time I go on a TJS stock up trip. One additional item I would add is unsweetened dried mango. It’s one of the few places where you can find dried mango without added sugar or preservatives for a reasonable price. Love Trader Joe’s and your website! Every Sunday I make a trip to pick-up my weekly goodies. I’m a teacher and I’m always looking for quality products that are less expensive and make prep time even easier. TJs also has really good prices on lemons and limes which tend to be more costly in NJ food stores. I buy the mirapoix and combine it with yellow and orange peppers, corn, diced tomatoes wth green chilis, black beans, kidney beans, and pinto beans to make a vegetable chili. It’s amazing in the winter, but also really good in the summer over a salad with avocado. 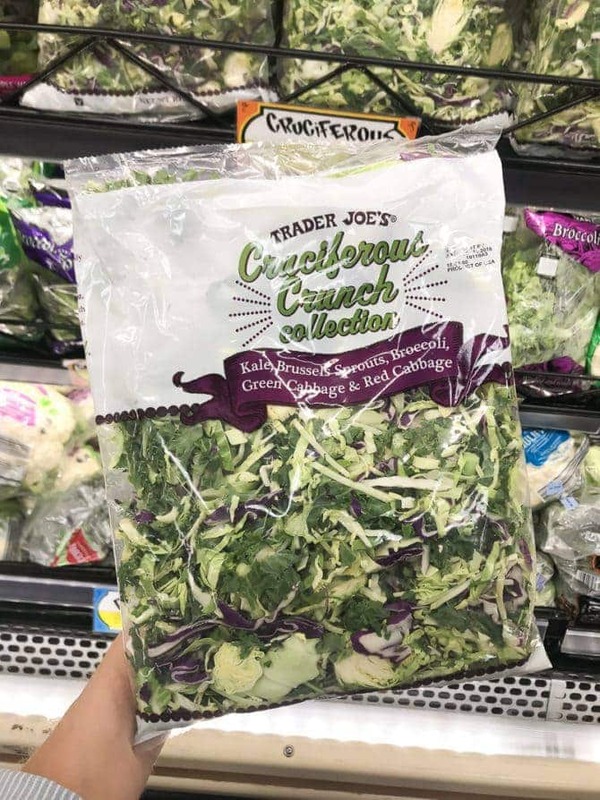 Quick question… Where can I find the Salad Topper? I haven’t seen it at mine, but then again I’m usually on autopilot when I go and don’t always look for new items. Lastly, as an aside, I also really like the Coconut Body Butter. 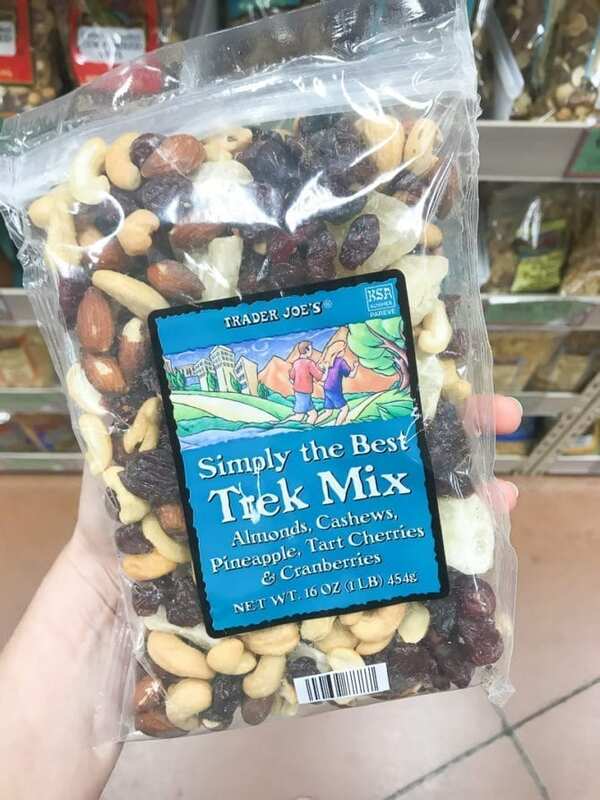 I found the salad topper in the refrigerated section near the salad greens, but I read online that sometimes it’s kept with the nuts and dried fruit. Hopefully you’re able to find it next time you go. 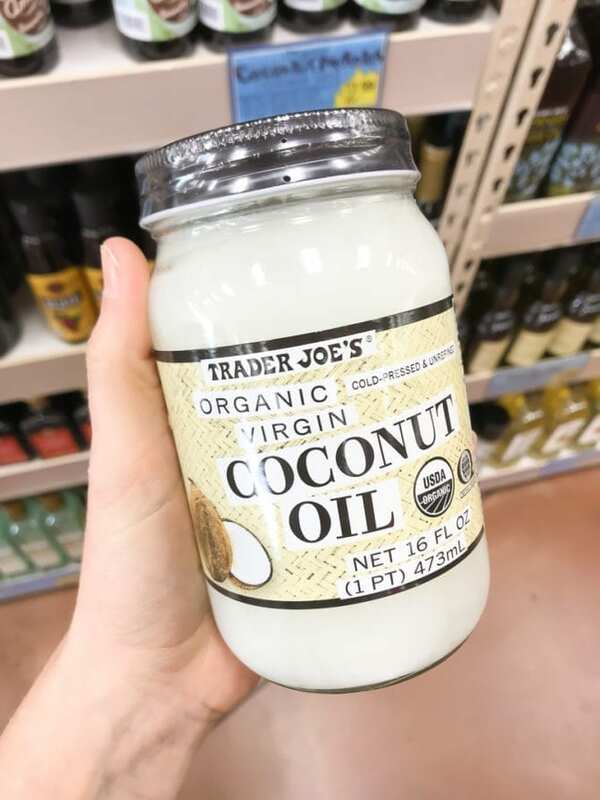 And yes, I love some of the TJ’s body products too — I’ll have to try the coconut body butter. I love the honey mango shave cream! Love your list – thanks for sharing…. 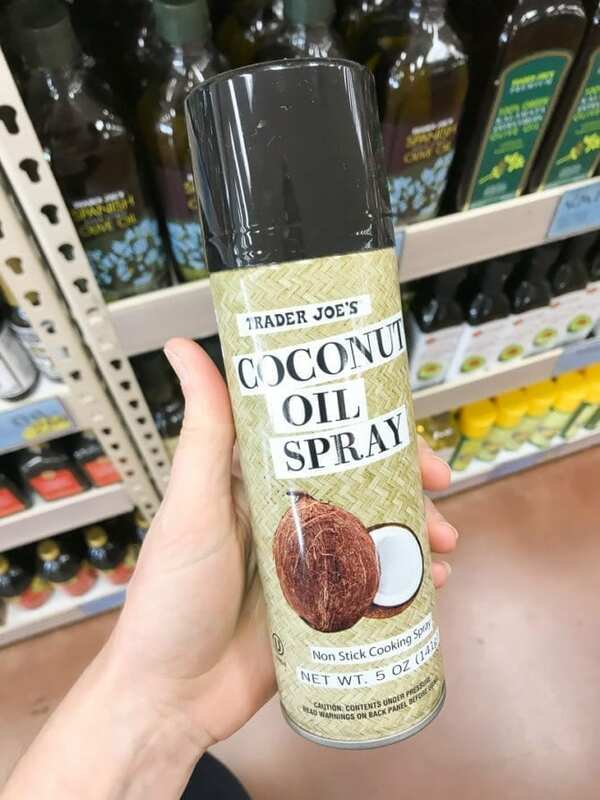 while not a food item, but a Trader Joe staple for me is the Tea Tree body wash and the Tea Tree shampoo – really wakes you up and if you have bug bites or any itchy skin (like from a rash) the tea tree body wash is awesome to use. I hope someday soon I have a TJ’s in my town! I love going there to stock up on pantry goods though whenever I’m near one! 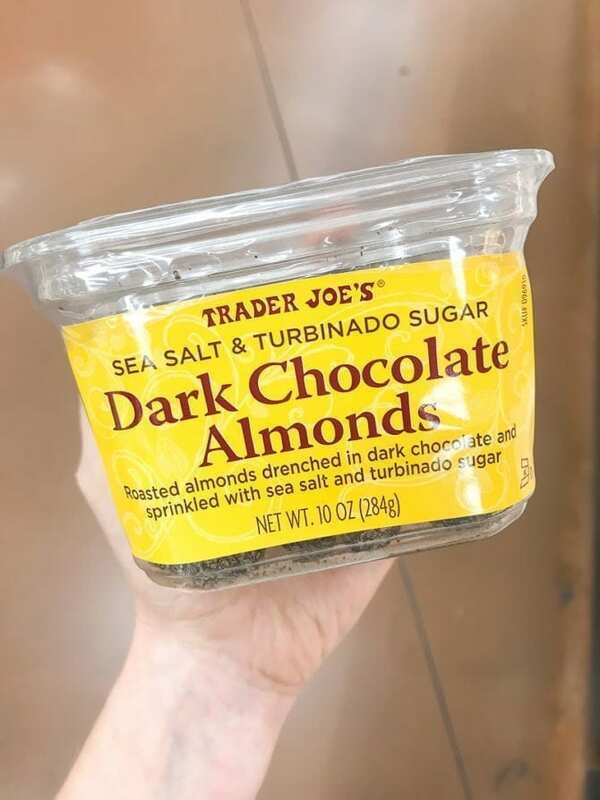 I have some of the dark chocolate sea salt almonds in my pantry now….to die for!! Their vegan kale basil cashew pesto is amazing, too! every time I try to fill in the boxes for the meal plan, my computer freezes. Tried about 5 times now and it won’t work. Meal plan not emailed when I signed up. Any idea why? Thanks! Please send the TJ meal plan. 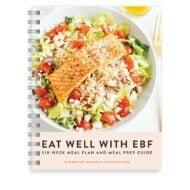 Just added you to the list so you should receive the meal plan in your inbox this afternoon. Can you give more specifics on how you use some of these? Ie, hummus on salad? Hummus in tuna salad?! I have never thought of using those ingredients like that and I need details/a recipe, lol. This is incredibly helpful! I’ve started doing TJ’s a lot more since this post. Nice new things I’ve never heard of (cauliflower gnocchi!) and other staples I didn’t know they had. Thank you! this is basically our trader joe’s haul…so many similarities and so many good things here! we do most of our shopping at tjs now and just buy meat and a few items at whole foods. it has saved us so much money!